This kit is built around the VA903 three-bulb fluorescent flood light. The VA902 is an economical fluorescent head that draws only 90 watts, yet delivers 4,500 lumens, and is 5500°K daylight balanced without the need for color conversion filters. The included 13" reflector provides a wide, even spread of light, and a diffusion panel (also included) can optionally be used for even softer portrait lighting. The head angle is easily adjusted with its convenient positioning handle and tilting 5/8" light stand mount. It includes a 13' detachable grounded power cord. The SP Systems Desktop Shooting Table consists of a frame and sheet of white translucent plexiglass. Overhead lighting is possible with the Impact Convertible Boom Arm/Light Stand. As a light stand, it can support a small or medium light head to a height of 13' (4 m). Raise the second section completely, click, and it is a boom stand. Instructions for Using This Stand as a Boom: 1. Loosen the large long handle in the middle of the stand. 2. Loosen the top-most section of the stand. Pull that section all the way up. 3. Pull! - swing it horizontally for the boom feature, and lock it for the desired setup. The SP Systems Desktop Shooting Table consists of a frame and sheet of white translucent plexiglass. Add your own lights, placing them over, under and around your small subject. Horizontal shooting area: 23.25 x 17". Curved vertical rise: 23.25 x 14.5". Includes 23.25 x 35.5" plexiglass sheet. 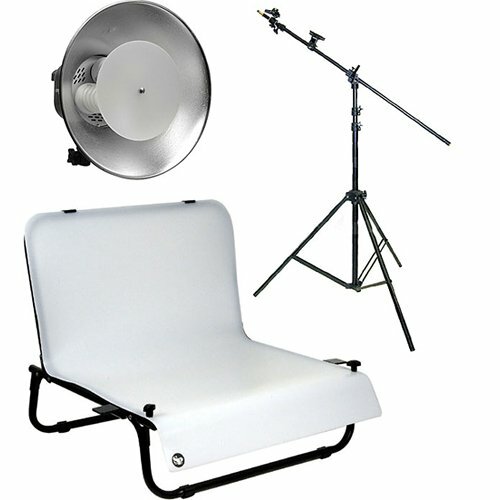 MyStudio MS20CYC Professional Table Top Photo Studio Seamless Photo Cyc Background for Product Photography, 20"x 20"x 12"